Labour’s candidate in the Copeland by-election has accused Theresa May of a “disgraceful snub” to local NHS campaigners as the row intensified over the refusal of Downing Street to accept a petition over hospital cuts. Gillian Troughton, a St John ambulance driver, today aimed to increase the pressure on her Tory rivals, with polls due to open tomorrow morning. May was forced on the defensive at prime minister’s questions when a Labour backbencher highlighted the decision by Downing Street officials to turn away Cumbrian MP Sue Hayman, who had arrived to hand over a petition containing 30,000 signatures, in protest at plans to cut consultant-led maternity services at the West Cumberland hospital. Hayman, MP for Workington, near to Copeland, was told “You can’t come in. Today is not a good day. After Thursday would be better,” according to the local News & Star. Troughton, who is aiming to retain Copeland for Labour following the resignation of Jamie Reed, said the gesture revealed the Tories’ true attitude towards the NHS. “Time and time again the Prime Minister has being given opportunities to act to halt the cuts to West Cumberland Hospital and every time she has refused to do so,” she said. “Her snub of the campaigners delivering their petition to Downing Street yesterday was a disgrace – it speaks volumes for this government’s attitude towards our local health services. 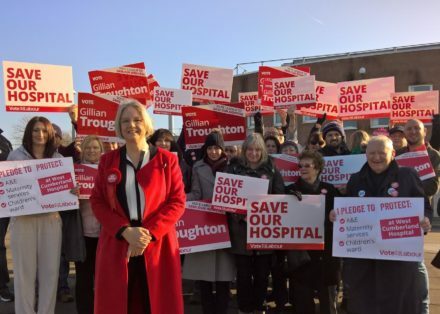 The future of the hospital has been at the centre of the by-election with Troughton highlighting her work in the health service amid an intense Tory campaign. Trudy Harrison, the Tory candidate, has pledged to stand up for local maternity services and highlighted the fact she gave birth to her four children at the hospital. Downing Street said “proper procedures”, which require five days’ notice to present a petition, were not followed by Labour. Hayman inissted, however, that Labour had done everything that was necessary to present a petition.